I copied these off of the "New wheels!" post because I thought the spoiler discussion deserved its' own thread. it is home made. it is just a piece of 1/8" or 3/16" ABS plastic that I cut out from a cardboard pattern. I used a heat gun to turn down the ends to match the hatch corners. than used two sided foam tape to hold it on. It kind of updates the look at the rear hatch like the newer cars. could not tell if it reduced drag at all, but it did seem to allow more dust accumulation on the back window. Easy to make, but too time consuming to make them to sell at a reasonable profit. Well it sure looks great. I just got a heatgun for various projects...might have to try it out. Here is an older pic of Peter's' car from the thread, I believe he is running the MR2 wheels now as seen in his avatar. This second image is from the forum, but HomeSkool hasn't visited in nearly a year and a half. Ironically enough, his last post related to adding a bumper hitch to the Tercel for pulling ??? 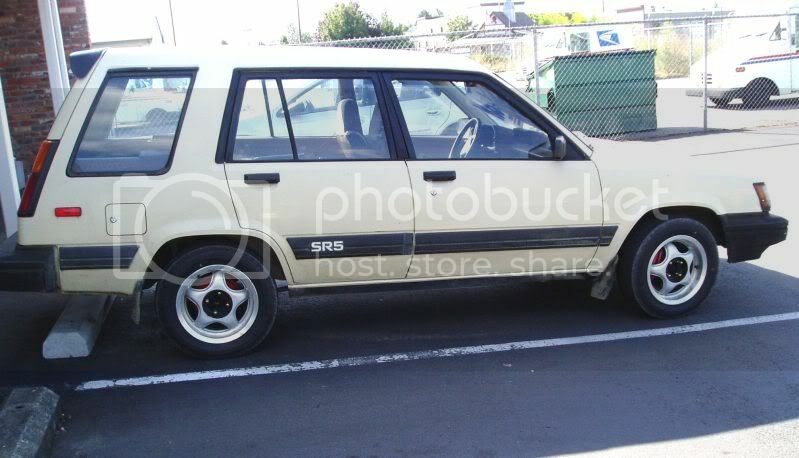 I do like the look, but I think I prefer the luggage rack or more likely a JY luggage rack on top of the Tercel and I don't know that they would look good together. I am still using the wheels in the pic of my daily driver. the spoiler came off because many times I carry lumber or kayaks directly on the roof of the Tercel (as you can see in the avatar, that is a home made sailing dingy), and when I open the hatch the spoiler will flex downward. It held on okay for a long time, but eventually the two sided foam tape broke free over part of it, so I pull it off the rest of the way so I would not lose it. it is still in my garage waiting for me to do a full body clean-up, touch up, minor rust repair, and buff out and wax. I will put it back on than. 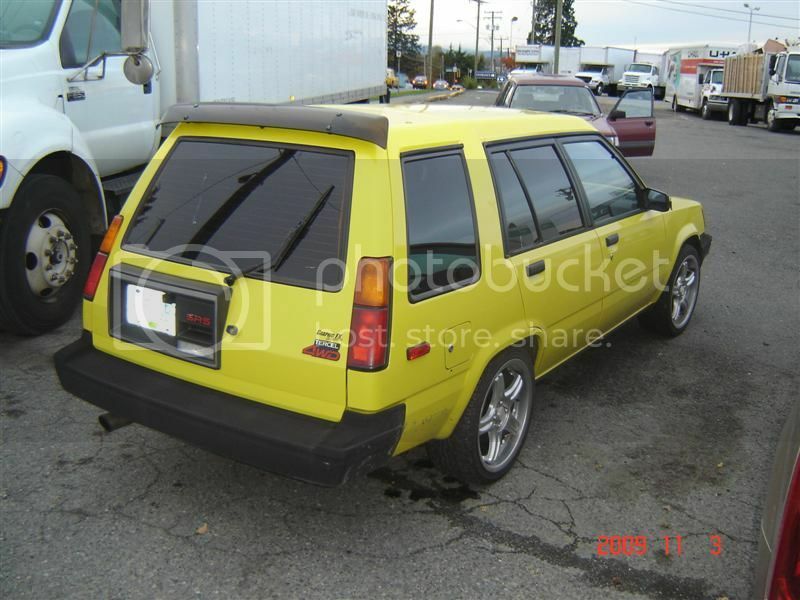 That spoiler on the yellow Tercel4wd came from the wrecking yard off of something else, and he adapted it to fit on the Tercel. that style keeps dust off the rear window better than my style, but I do not think it would reduce drag at all. mine was fairly easy to make, just use cardboard to make a pattern. Tape it on the rear hatch and than trim it so it is the correct size and wraps around the sides the way you want. than transfer the patter to some ABS sheet (ABS is best since it is UV resistant). when you heat shape it you will have to bend it past the curve you want because there is a fair amount of spring back even when it is heated up. Trial and error, you need a very tight fit to keep the two sided tape to stay put. I had planned on putting some screws into it to anchor it further, but the tape held up well, and I was chicken to put holes in the Tercel body that could leak.